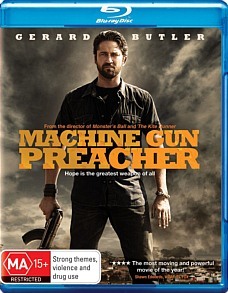 Machine Gun Preacher Blu-ray Review. In conclusion, Machine Gun Preacher is an interesting story that although attempts to justify violence with violence, it's more about highlighting the plight of these children, especially in light with the Kony 2012 viral infection. 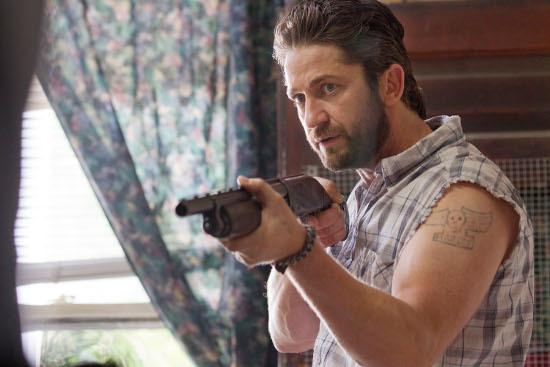 Strangely coinciding with the Kony 2012 phenomena, Machine Gun Preacher stars the charismatic Gerard Butler as Sam Childers, a former criminal turned missionary who fought for the orphans of Uganda and Sudan from the African Warlords. Almost sounding like a graphic novel, Machine Gun Preacher firsts introduces us to a very unlikeable Childers as he is released from prison. Fortunately Butler plays the clichéd criminal well as he resumes his life as a violent criminal with assistance from best friend Donny (Michael Shannon) but thanks to his ex-stripper wife Lynne (Michele Monaghan), she forces Sam to church which sets the seeds of Christianity into his persona. Although Childers doesn't become a preacher overnight, his trip to Africa ignites his path to redemption as he witnesses the abuse of the Lord's Resistance Army (LRA) against the children who have a history of humanitarian abuse and far worse. From here, Childers uses his past as a criminal (e.g. brute force and intimidation) to rescue these children soldiers and under the guidance of his newly found Christian morals, he helps build an orphanage in a militia owned territory to help get them rehabilitated. The shining light of Machine Gun Preacher is definitely Butler as the gun totting Machine Gun Preacher who portrays a man of god well but is not scared to use some force to rescue these abused children. On Blu-ray, the video quality is exceptional which definitely highlights the atrocities of child soldiers in Africa with some great use of the cinematography to highlight this. Colours have this real earthy feel and the Dolby Digital 5.1 surround sound is used well, especially with the sometimes over the top action sequences that at times come off a little too stereotypically for this action genre. In conclusion, Machine Gun Preacher is an interesting story that although attempts to justify violence with violence, it's more about highlighting the plight of these children, especially in light with the Kony 2012 viral infection.